George Cochran predicted the tournament would be won on deep brush, but decided to fish shallow anyway. Before the Forrest L. Wood Championship at Lake Hamilton, Ark. began, insiders buzzed about the local advantage. The field included a host of locals, including Rob Kilby, Scott Suggs, Jeremiah Kindy and George Cochran � not to mention Arkansan Larry Nixon and former Arkansan Greg Hackney. It was Cochran, though, who ruled the Championship. He worked hard for 4 days through a brutally tough bite � so tough one angler advanced with zero weight to fish day 4. On day 4, when it mattered most, he rocked a 10-03 limit and left the entire field in the dust. After an intense practice period that beat up the already sketchy bass population, plus 3 days of competition that removed most of the fish in key areas, he somehow � against all odds � caught 10-plus pounds. The win capped one of the most storied careers in pro fishing. The 55-year-old pro faced down the tour's youth movement and walked away the winner. Cochran has resided in Hot Springs, Ark. for 15 years and lives on Lake Hamilton. However, his summer experience on Hamilton, until the last week, had been limited. He said he fished the lake "probably 20 times," but never during the day in the summer. His only experience was during spring, "when it's good," and (on) "some night excursions" during summer. He also noted one of his two sons guides on Lake Ouachita, which empties into Hamilton. "They use mostly big shad for stripers. And a friend who's a bass guide, he uses creek minnows. They get around docks or brush and catch the heck out of them. But you go in front of them with artificials and it's tough � you can't get bit." With water temperatures in the high-80s and sunny conditions, he said he struggled all through practice. But he made a crucial decision. Even though he felt the tournament would be won on deep brush, he committed himself to fishing shallow. "I'm a shallow-water fisherman," he said. That's how I've always made my living. I knew I had to fish shallow to be comfortable." He narrowed down his strategy to some key banks with cover and docks. And he knew he had to get there early, before the hordes of pleasure-boaters turned the lake into a washing machine. But there was one bank � one special bank � he never touched. He also noted that, in practice, the fish were suspended around docks and shallow brushpiles, which made them exceptionally difficult to catch. He didn't have a lot of confidence as the tournament approached, but he would eventually downsize to catch those tough, early fish. The Championship format features bracket-style competition. Anglers are seeded based on their final Angler of the Year points standings. 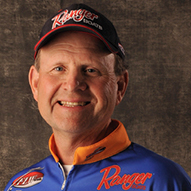 Cochran, who was 16th in the points, fished days 1 and 2 against Sandy Melvin, and won by a 5-14 margin. On day 3, weights were zeroed and he fished head-to-head against Brent Chapman. He won that matchup by a narrow 1-03 margin. He started out each morning throwing topwaters � a Strike King Spit-N-King and a Storm Baby ChugBug. He caught some fish off shallow brushpiles, but said his best fish came from docks. And he fished within sight of his home nearly the entire tournament. His early-day strategy was to work down a bank and hit the docks with one of the topwaters, then turn around and come back with the other. "The reason I fished the same banks sometimes twice was to show them a different lure. In this clear water, the fish get a real good look at the bait." As the morning bite fizzled out, he skipped a wacky-rigged 5" Strike King 3X Floating Worm ("purple or gray") underneath docks. > Days 1 and 2 were hot and sunny, but a significant thunderstorm struck the lake on day 3. Cochran was one of 12 anglers who survived to fish day 4. Again, weights were zeroed, so it was a 1-day shootout for the 1st-place, half-million prize. All through practice, and all through the tournament � even though he needed crucial 2-pound fish to assure his advance � he laid off a certain stretch of bank. It was 300 yards from his house, and on the morning of day 4, with everything on the line, he went straight there. He saved his best spot for last and caught the winning limit right away on day 4. "Most people think � blame it on Hamilton, that's where he lives," he said. "But I haven't fished this lake in 8 years. The reason I fished near home, was the pattern I was running I was trying to catch fish early on deep, main-lake docks. I knew some good, deep docks, but I saved a spot for the last. "There's very few times in your fishing career that everything goes like you planned, and it did in this tournament. I knew I could catch some fish on this bank. Me and my son had caught good fish on it at a night tournament years ago. I never fished it in practice, and never in the tournament. I was waiting until the final round. "It's an area where the lake bottlenecks, and there's tremendous boat traffic. I knew (because of the traffic) that nobody would fish it. But that's why you have to get there early. After 8:00, it's over." With that in mind, he headed straight there. "It went just like I planned," he said. "I caught one on my first cast, then a keeper on my second. In less than an hour I had a limit. I culled a couple of fish, and by 9:00, I had what I had. "That's the reason I did that (saved the spot). In a tournament like this, you'd better have an ace in the hole." He caught a 2- and a 3-pounder off that bank, and they were the two fish that sealed the win. "I caught my two best fish on a buzzbait. I was throwing behind docks where nobody could fish, with heavy 15-pound P-line, and pulling it over the cables." On working the buzzbait that morning, he said: "You could not work the bait slow. If you did, they'd turn up, look and turn away. You had to throw it out, and the minute it hit the water, work it to where it's spitting. (That way the bass) see something trying to get away." > Buzzbait gear: 7' medium Daiwa Light and Tough cranking rod, Daiwa Millionaire Casting Reel, 15-pound P-Line, 1/4-ounce War Eagle buzzbait (red head, white skirt, chrome blade). > He's sponsored by Strike King, but threw the War Eagle buzzer. "For some reason, on this lake, they like that War Eagle 1/4-ounce. But day 4 was the only day I caught any fish on it. It has some kind of tinsel on the blade and it spits water up in the air." > Day 2 was his best day with the Floating Worm. "I caught six keepers on it that day," he said. "I never caught them good on it after that. I was skipping that 3X bait up in real shallow water in the shade, and they'd hit is just as soon as I skipped it. I never caught one working it. A good friend of mine, Larry Nixon, was catching some on the wacky worm too." > On his custom topwater rod, he noted: "I brought it back from Japan. It's like a feather in your hand. They made this one for me. It's actually the lightest rod I've ever used. All you feel is the reel in your hand. That enables me to work a topwater really fast. It has tiny eyes, and it's just a real good feel with topwater baits." > Main factor in his success � "Using strategy. I saved my best area for the last day. It was where the lake narrows down, and there's a stretch about a half-mile long that's the narrowest part of the whole lake. The boat traffic is terrible. You can't hardly fish after 8:00, and I had a limit by 8:30 (on day 4)." > He noted that, on the last day, he never lost a fish. "That's how you win a tournament like this." > Prior to the Championship, he'd picked up another sponsor. "I picked up CLC Custom LeatherCraft in Okla. � a leather company owned by Ron Pickens. They make back braces, tool belts � all that stuff people use around their waist when they're building homes." 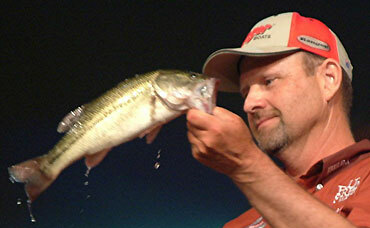 > His only other FLW Tour win was at Kentucky Lake in 1996. > He said it was "funny" he fished from the Field & Stream boat on day 4. "When I was 9 years old, that's the magazine I read from cover to cover. It kind of gave me the chills." > He said he didn't know if he'd won when he arrived at weigh-in. But he "had a good idea." FLW Outdoors ran a new satellite update service during the event, and fans could watch to see who caught what. "Everytime you catch a fish it goes on the Internet. I had five boats this morning, but at 8:30 I had 20 boats. At 10:30 I had 40 boats. I guess they saw the Internet."